The air is hot and sultry, weighted with smoke and sea salt and the heady balm of pig fat. It’s not exactly soup weather. 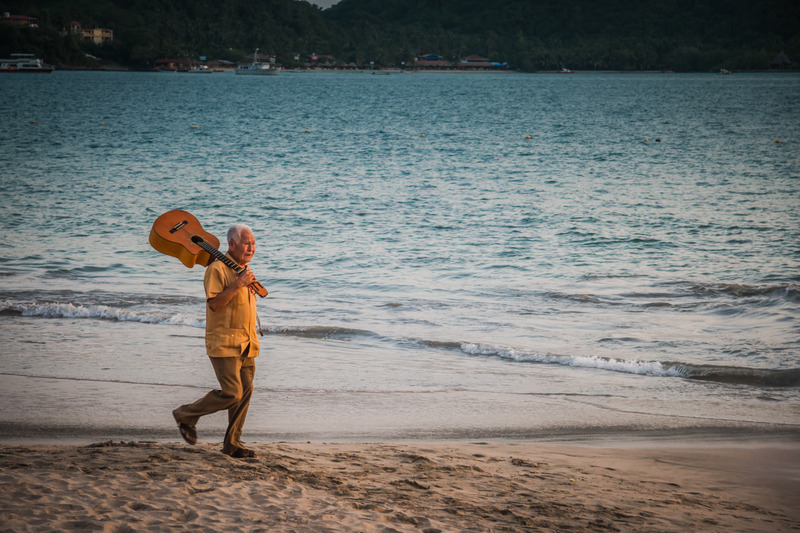 It’s the rainy season, July, when I’m in Zihuatanejo, which doesn’t translate to any actual rain but rather a steamy, lazy heaviness that’s boxed in by an unrelenting sun, with the Pacific Ocean in front and the Sierra Madre del Sur behind. The smoke hints at something delicious. It wafts over residential walls from busy kitchens whose stoves are powered by wood. 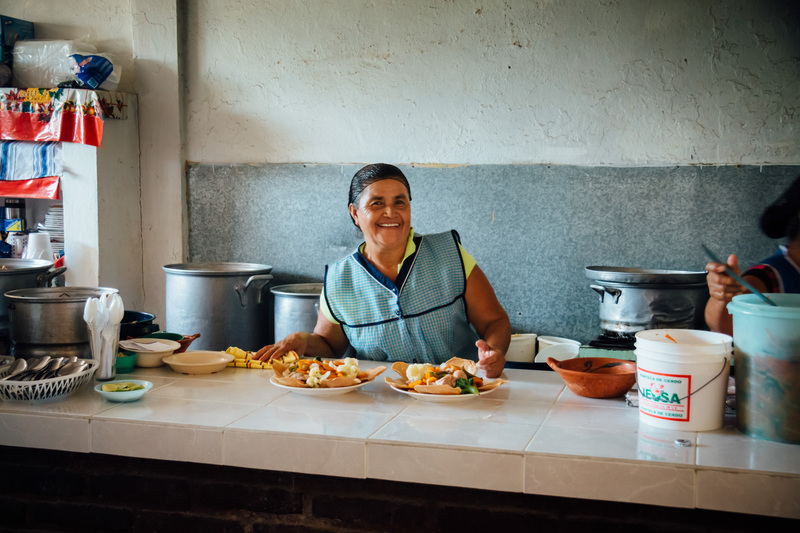 The aroma of simmering pork broth outpaces the idle breeze that carries it from El Profe, a pozoleria on the outskirts of town, on an unmarked road just off the empty highway. It’s the middle of the afternoon. A scruffy black dog slumbers in the dirt on the shoulder of the street, watching us with one eye. He’s too hot and uninterested to lift his head as my new friends and I attempt to parallel park in the space that he has claimed. He refuses to budge, so we continue down the block to the next available space. What scant traffic we encountered on the highway seems to have exited on the same unpaved street as us, with the same goal in mind. There is nowhere to park. 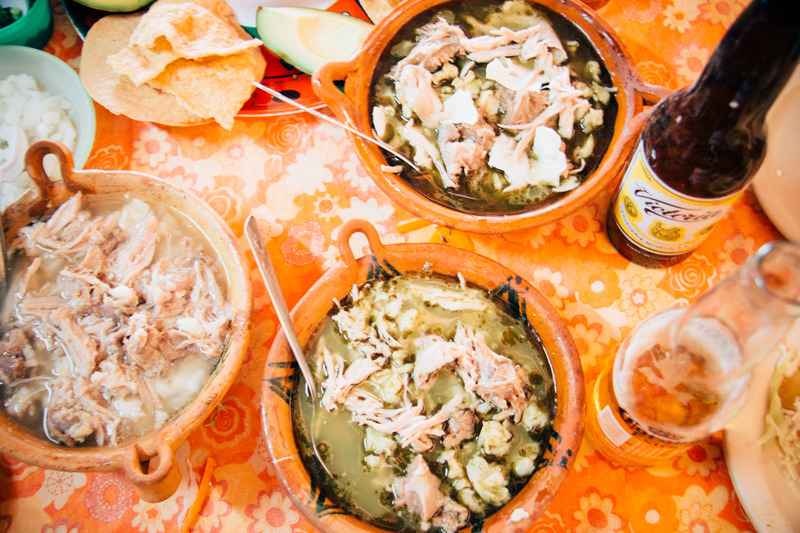 It’s Thursday, and in Zihuatanejo that means only one thing: It’s pozole time. 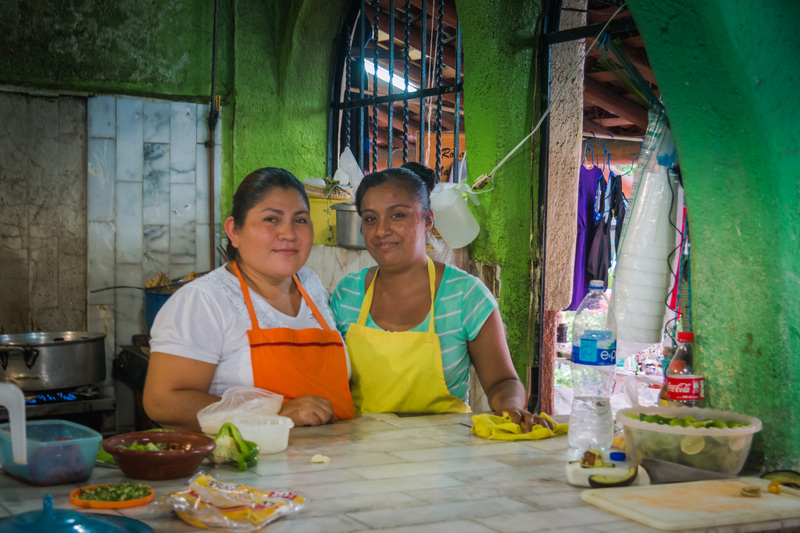 El Profe is one of the many pozolerias in Zihuatanejo that open only on Thursdays for the express purpose of serving pozole. If you were to drive past this place on a Tuesday, or Saturday, or any day but Thursday, you would easily assume this cinderblock shell of a building, merely a two-car garage with a Spanish-tile roof and no front door, was abandoned. But today everyone from the neighborhood is here. Just inside the sparsely decorated carport, a half-dozen plastic tables are draped with brightly colored tablecloths. We arrive just in time. There is still one table open. Fans whir and oscillate from every corner, a feeble attempt at circulating the strong-willed tropical air and the unforgiving heat that radiates from the kitchen. A sign on the wall near the entrance reads, “No firmas. No excepción.” In other words: Everyone must pay, today, with cash. No credit. No exceptions. In the semi-open kitchen three women from three generations, dressed in lacy smocks and aprons, silently tend to 20-gallon pots of simmering pork broth. 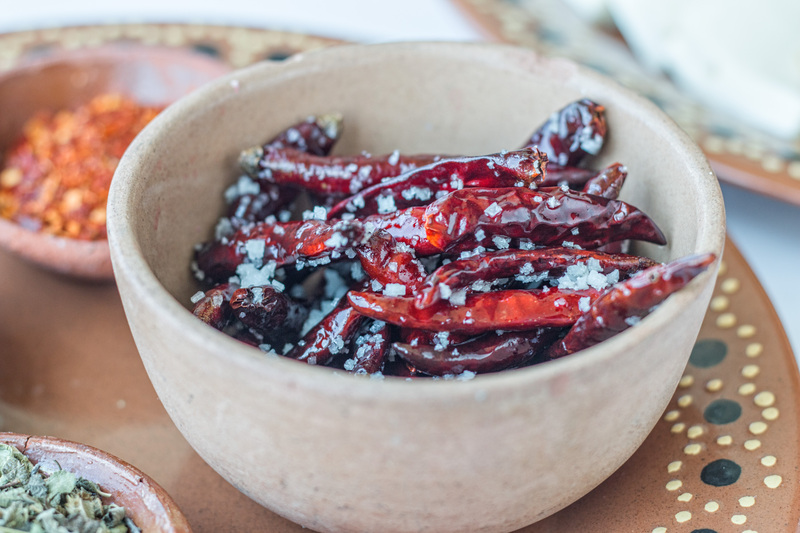 Although pozolerias exist for and because of pozole, they also provide a requisite spread of accompaniments such as guacamole, chicharrones, tostadas, tamales and pencil-thin taquitos filled with local cheese or maybe a small morsel of chicken. And mezcal. Oh, yes, lots of mezcal. 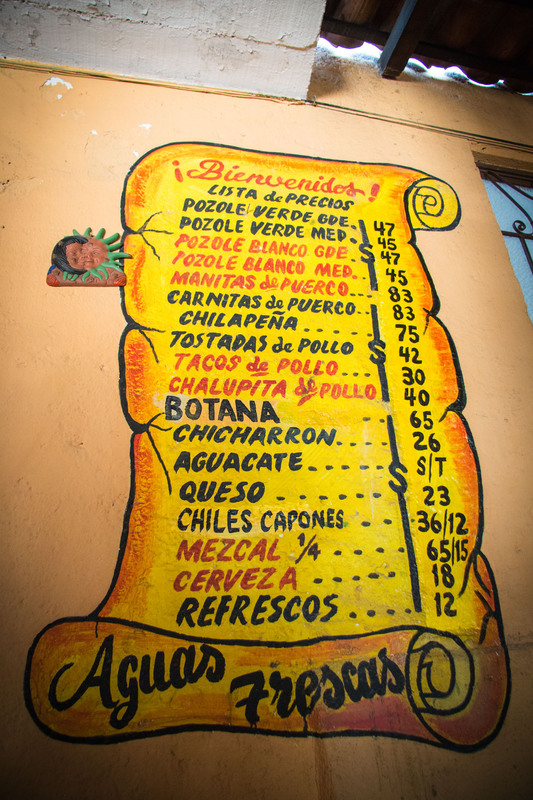 The menu at El Profe is so simple and static that it is painted permanently on the wall. A bowl of pozole costs 45 pesos (about $3.50). Enough mezcal to thoroughly inebriate my small group costs a dollar or so more. The two always go hand in hand. No exceptions. For luck, they insist. The mezcal arrives quickly, accompanied by wedges of oranges and limes. The possibly homemade liquor comes in a recycled glass jar slightly smaller than a beer bottle, tapped from a much larger keg with no commercial label. We’re given tiny clay cups from which to sip. Pozole Thursdays are a festive but civilized affair. A woman across the room, probably in her 70s, catches my gaze and raises her miniature cup and nods. 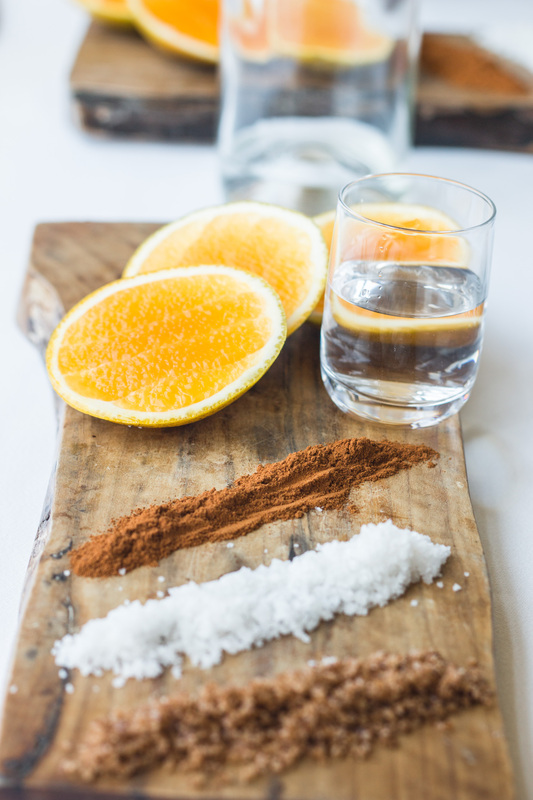 I lift my own cup and splash the smoky mezcal across my tongue, then scrape a piece of orange between my teeth to soften its jolt. A shockwave of heat pulsates down my throat. The air suddenly feels lighter, cooler. I feel luckier already. And here comes the pozole. Big, steaming-hot bowls of pozole. 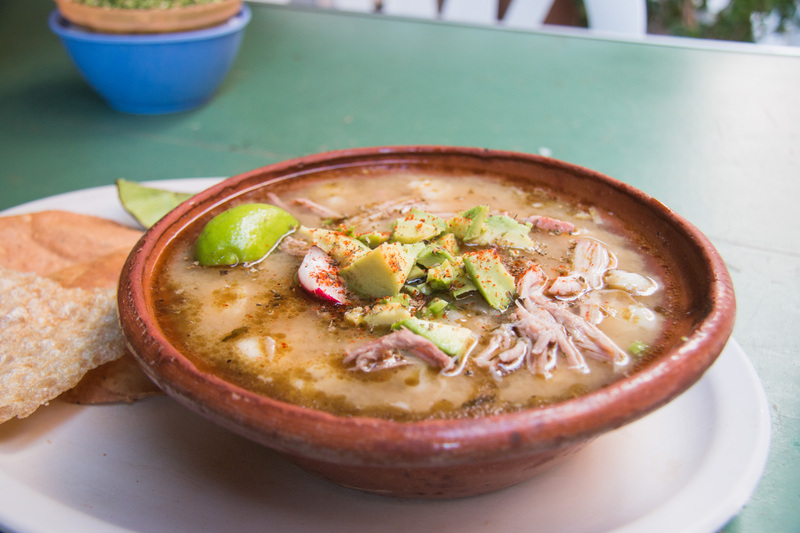 Pozole, of course, is one of Mexico’s most famous dishes, a hearty soup of hominy – from which it derives the name – and pork, mostly the head and trotters, but also the meatier cuts transformed into carnitas. Throughout Mexico and most of the United States, pozole is commonly understood to be red, getting its color from an adobo of dried chilies. But every region in Mexico has its own variation, and here in the state of Guerrero, the preferred color is white. Or, more accurately, clear. 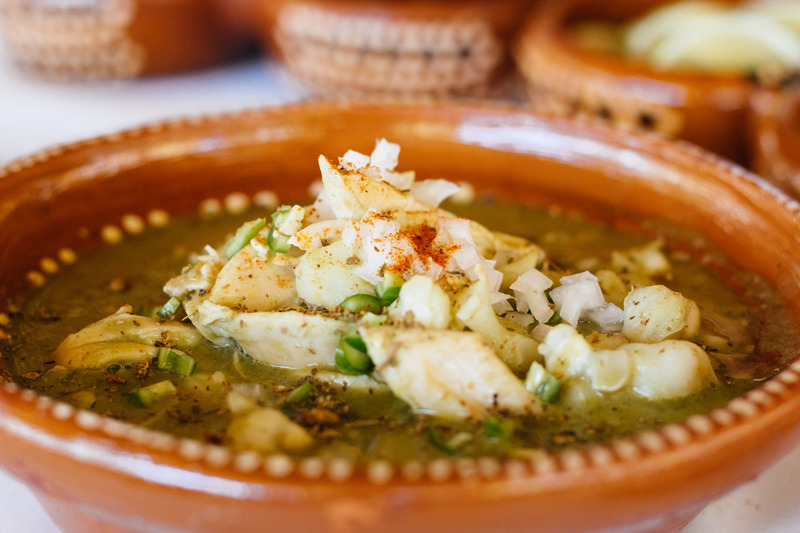 The person eating the soup must decide whether to leave it white or paint it green or red by adding one of the accompanying salsas. Doctoring your own pozole is an art: lime, avocado, onion, oregano, chilies, sometimes shredded lettuce, perhaps a crumble of chicharron. Everyone must discover their own balance. 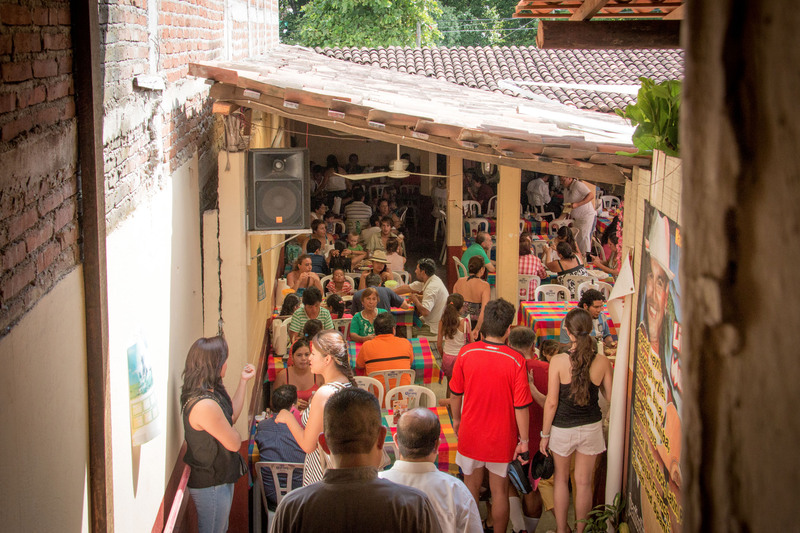 What’s most unique about pozole in Zihuatanejo, though, is that this happens on Thursdays – every Thursday, year-round, no exceptions. 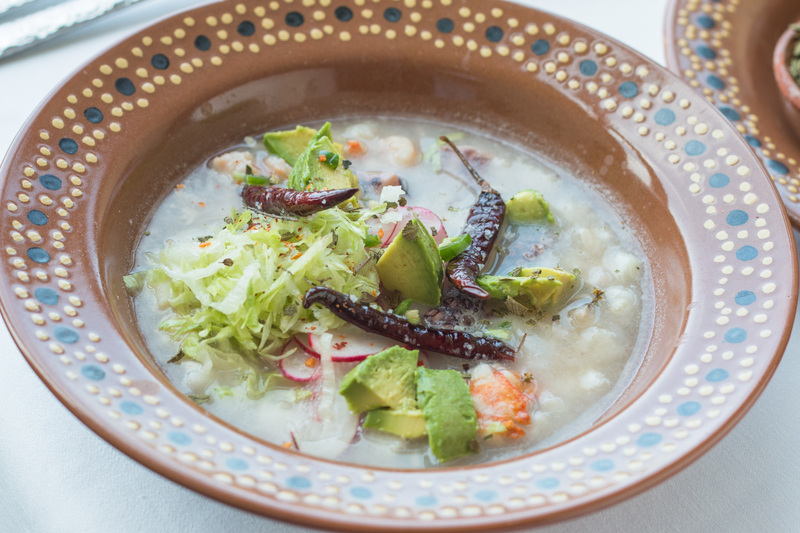 Anywhere else, pozole is reserved for family gatherings, weekends or special occasions. 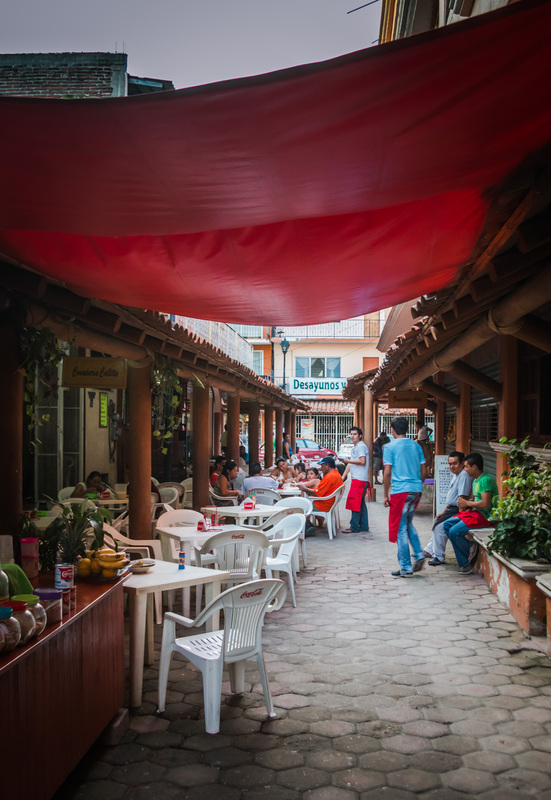 The Thursday scene at Santa Prisca, a pozoleria in the more affluent neighborhood of El Limon, is even more festive. The makeshift dining hall is set up in what appears to be someone’s sprawling courtyard patio, seven times the size of El Profe. Every seat is taken, and there’s a horde of people patiently waiting in line. On the edge of the dining room is a small stage where a man who bears a striking resemblance to former president Vicente Fox strums an acoustic guitar and sings love songs in Spanish. 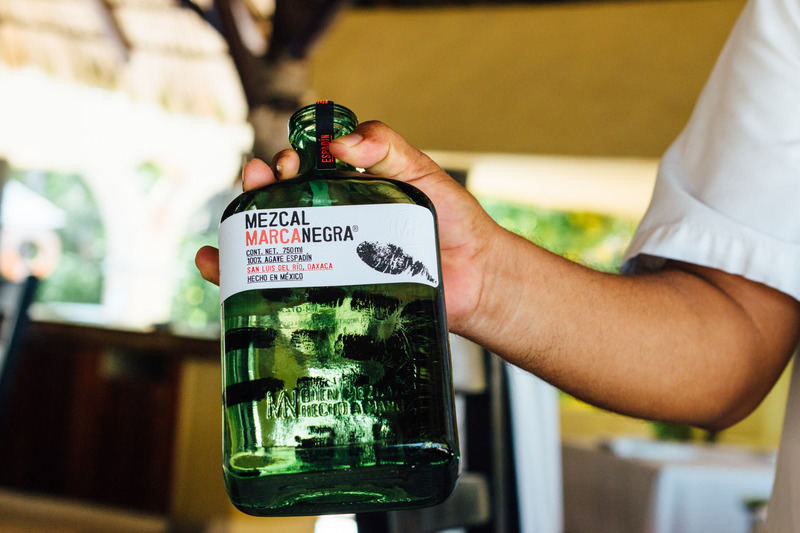 The mezcal at Santa Prisca arrives in recycled plastic bottles, maybe 6 ounces each. The waiters don’t ask if you want mezcal. They simply ask how many shot glasses they should bring. The liquor here has a surprisingly floral, almost sweet finish that lingers just beneath a smoky surface. 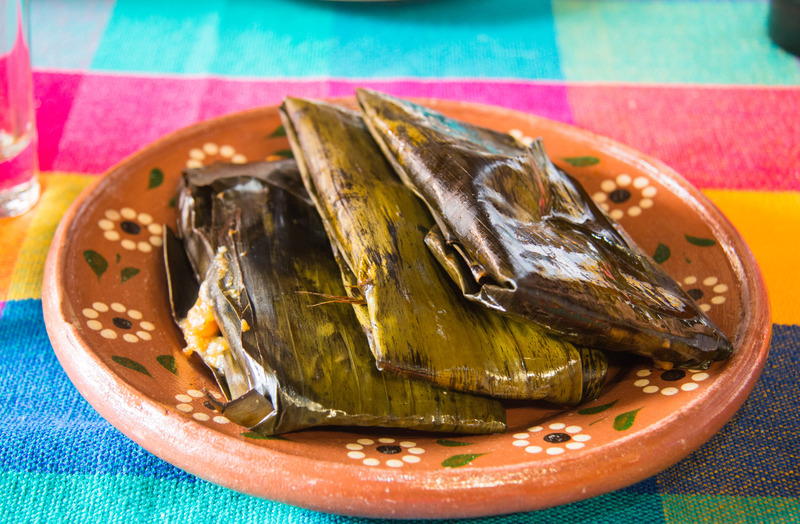 The nacatamales are exquisite, as thin and flat as crepes, wrapped in banana leaves and richly perfumed with dried chilies and lard. 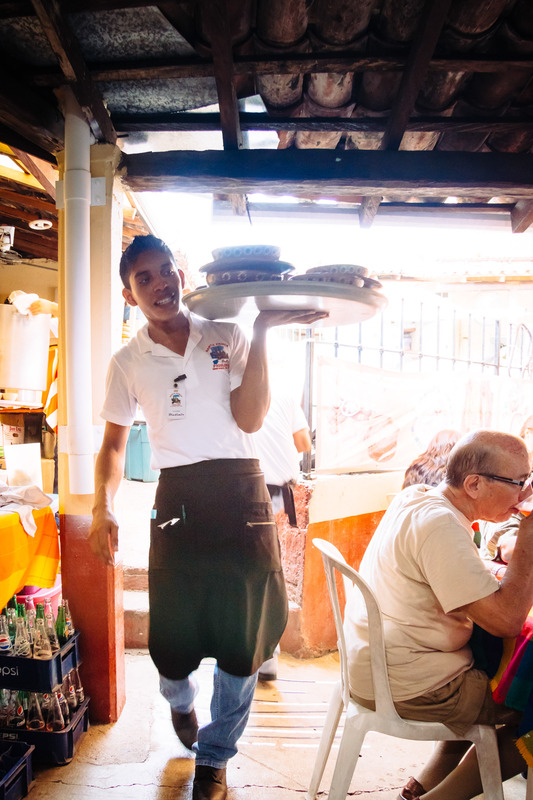 Waiters zigzag through the crowded courtyard with heavy trays of pozole hoisted high above their heads. Zihuatanejo is often hyphenated with Ixtapa, its sister city 3 miles to the north. Together they form the upper tip of Mexico’s La Costa Grande, which ends with Acapulco a half-day’s drive to the south. 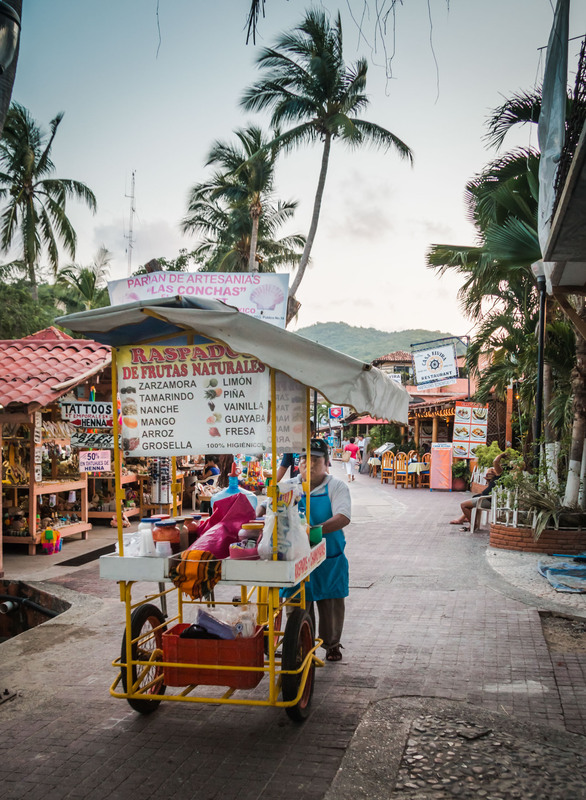 Zihuatanejo is a quaint fishing village that dates to pre-Hispanic times. Downtown sprang up around the beach where fishermen still gather every morning to sell their catch: clams, needlefish, snook, red snapper, monkfish, tuna, an absolutely enormous grouper … . In the languid shade of wild coconut palms, proud fishermen spread plastic tarps on the sand next to their wooden boats to display their bounties. Pedestrians, almost entirely local, meander along the promenade that hugs the beach at the edge of El Centro. Come dusk, this is where they’ll gather to dance in the community gazebo. 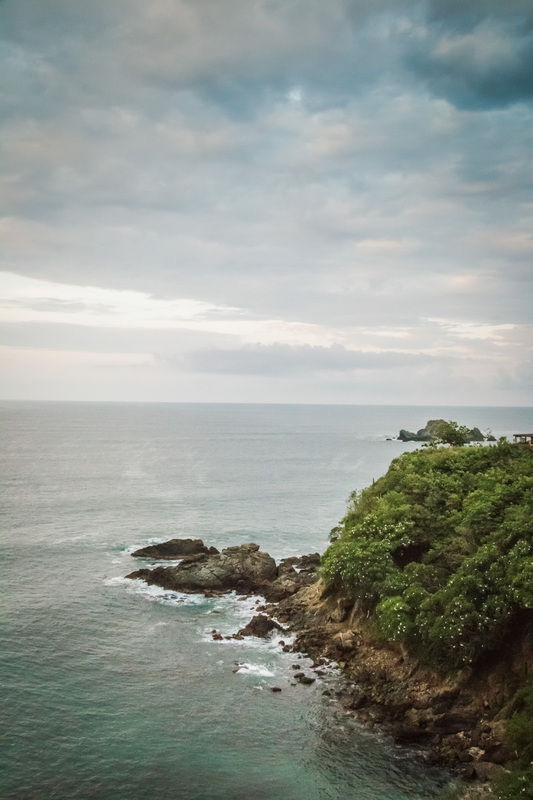 Ixtapa is a former coconut plantation that the government turned into a resort community in the ’70s. 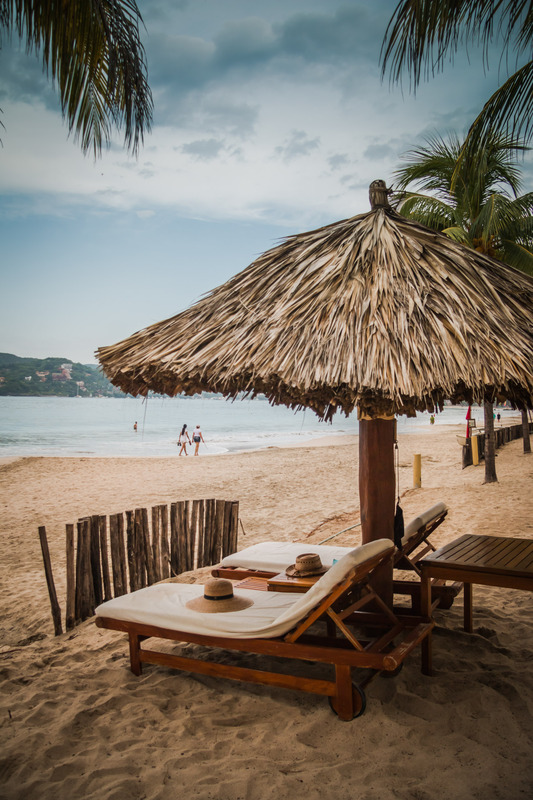 The main beach in Ixtapa is lined with dated high-rise hotels while the area’s more secluded bay is home to opulent condos discreetly snuggled into the rugged cliffs. Nobody comes to Ixtapa-Zihuatanejo to party. The revelers moved on years ago. It does not have the cache of Cabo or the Riviera Maya. It has something even better: pure serenity. But for the occasional seagull or solo mariachi, the beaches here are quiet. The downtown bars are low-key and mostly dark. 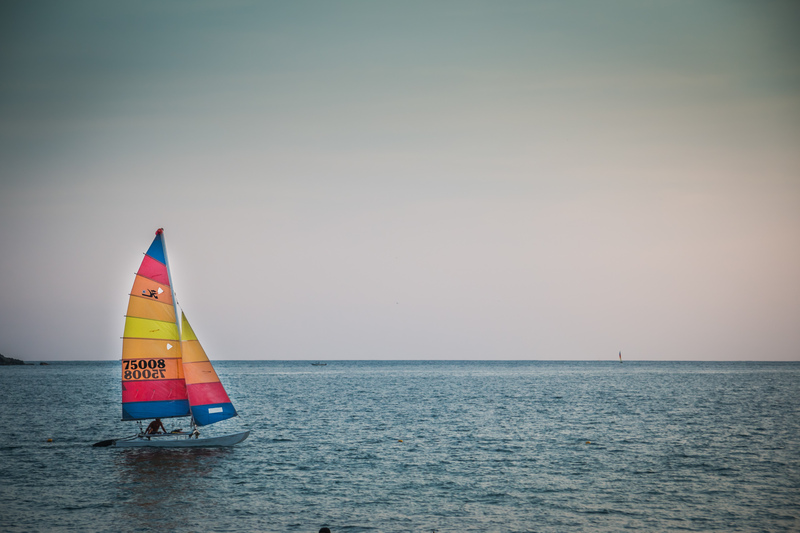 Thursdays are the one day of the week when Zihuatanejo comes to life – from mid-afternoon until sundown, after which the calm quietly resettles. 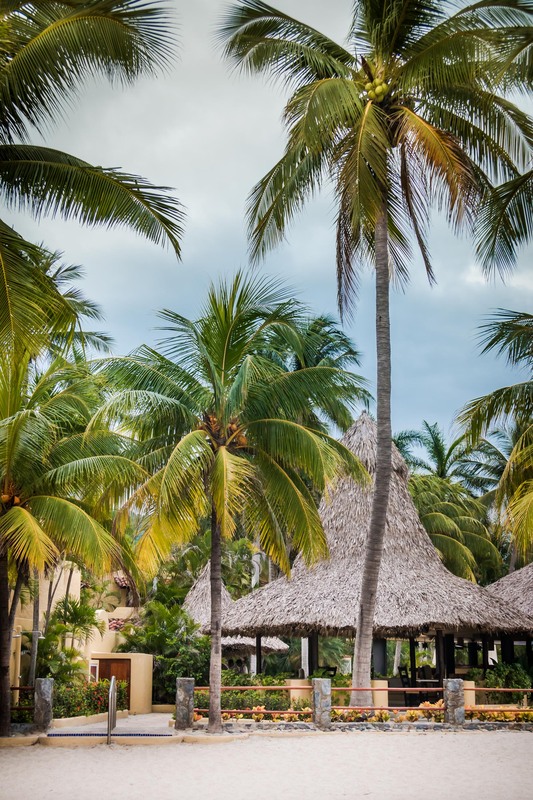 When hotelier Martin Kipping moved to Zihuatanejo a few years ago to assume his post as general manager of the Viceroy resort on Playa La Ropa, he did what any new manager would do: He invited his senior staff to a meeting. “Let’s get together tomorrow at 3 o’clock,” he told them. Everyone nodded enthusiastically. Kipping didn’t yet understand the phenomenon of Jueves Pozolero. But he agreed. And when Thursday rolled around, it all made sense. The Viceroy celebrates Pozole Thursdays in the employee cafeteria every week. No meetings allowed that day. Chef Jose Paco Isordia Dorantes has been the resort’s head chef for more than 25 years, since long before it was rechristened as Viceroy. In the employee cafeteria on Thursdays, he serves white pozole with pork. I ask him if it comes with mezcal. “Maybe. Probably. A little,” he says, grinning ear to ear. And at the open-air beachfront restaurant, La Villa, he offers a much more elaborate version for hotel guests. 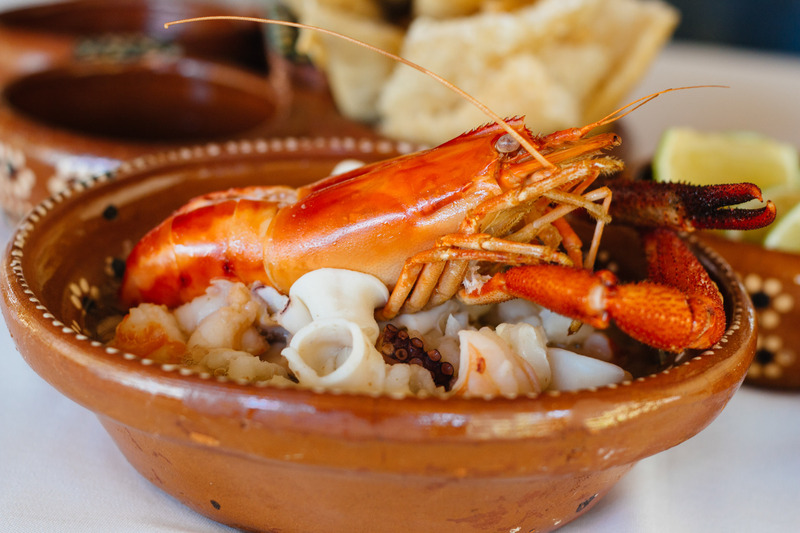 He serves a choice of red pozole with pork, green pozole with chicken or white pozole with a whole baby lobster, plus shrimp and squid, all from local waters. Although he’s from Guerrero, he prefers the green, he says with a defiant shrug. A big, steaming bowl of soup on a sweltering day at the beach doesn’t always appeal to tourists, laments Miguel Baltazar, head chef at Capella, Ixtapa’s most luxurious modern resort, perched on the cliffs amid the enclave’s most exclusive private villas. Baltazar made it to the finals last year in Mexico’s grueling chef-of-the-year competition, an Iron Chef-style battle held across the country. He won the regional semifinals, then went on to compete for the crown in Mexico City but didn’t win. He plans to try again next year. 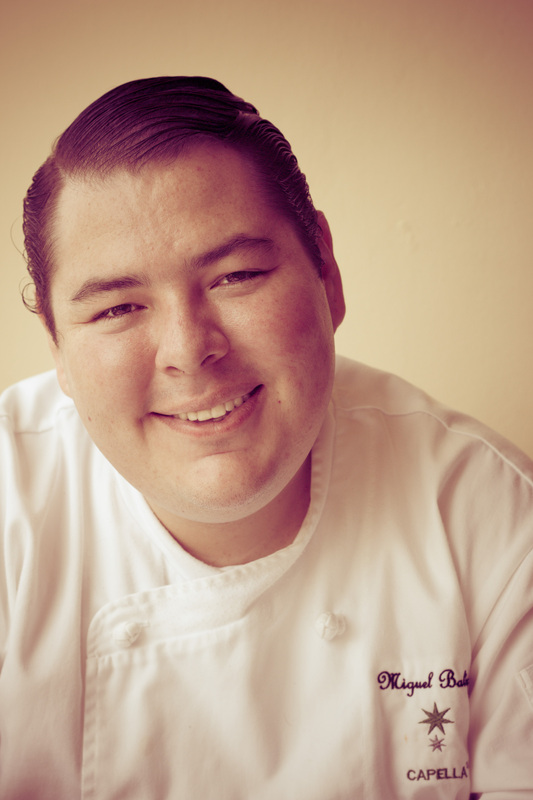 His eyes light up when he mentions his grandmother’s pozole, the recipe that inspires his own variations at the resort. 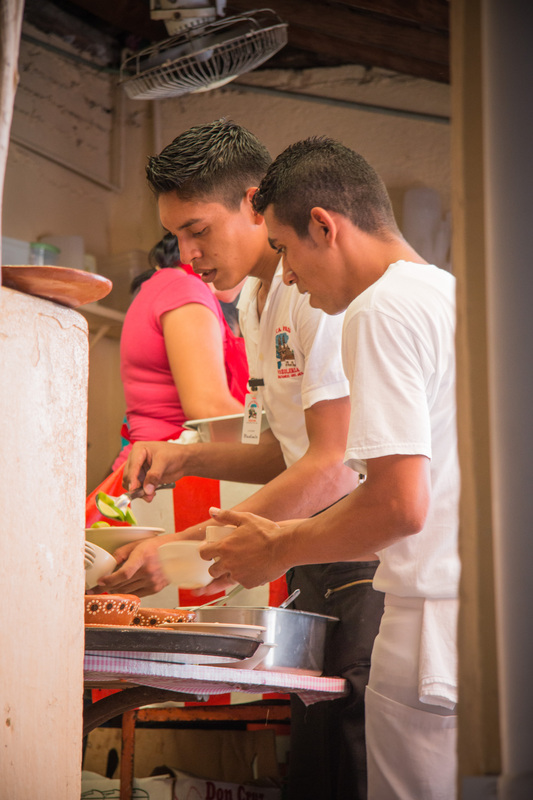 Capella also celebrates Pozole Thursdays in its employee cafeteria, where Baltazar serves his grandmother’s traditional white version. “For the employees, I make it with the pig’s head,” he says. 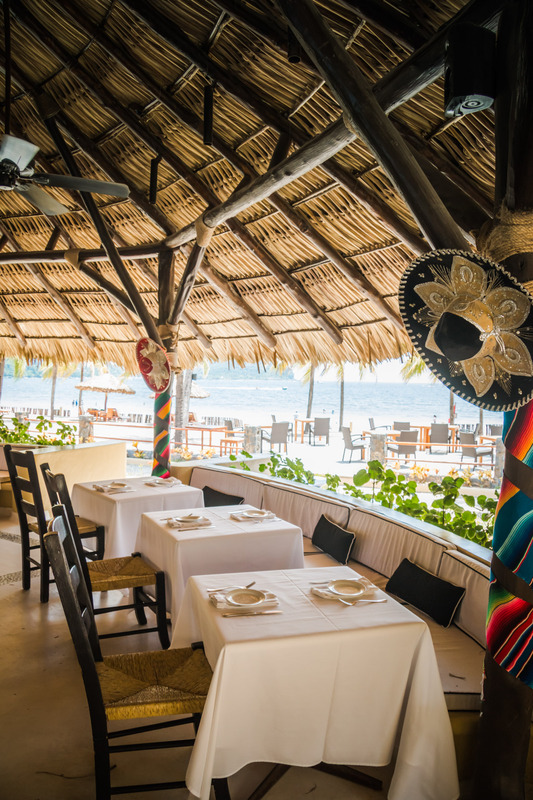 But for the resort’s air-conditioned fine-dining restaurant, A Mares, his white pozole is made with lobster and octopus caught by his regular fishermen. 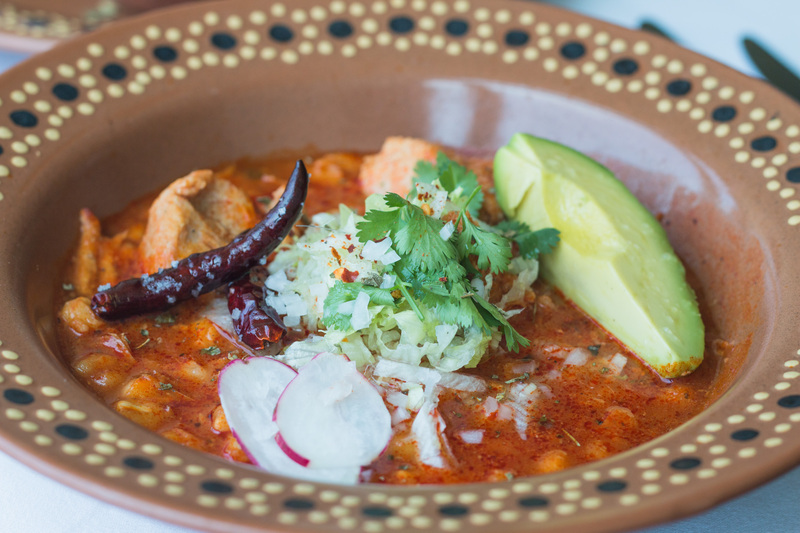 Although that’s the only pozole that’s officially printed on the menu at Capella, regular guests know that pozole is always available, off-menu, no matter the day of the week. He routinely creates customized vertical tastings of white, green and red. Baltazar’s green pozole is flavored with mole verde, a vibrant sauce made with pumpkin seeds, jalapeños, epazote and charred tomatillos. The red pozole is even richer and spicier, flavored with toasted guajillo and arbol chilies along with oregano and garlic. 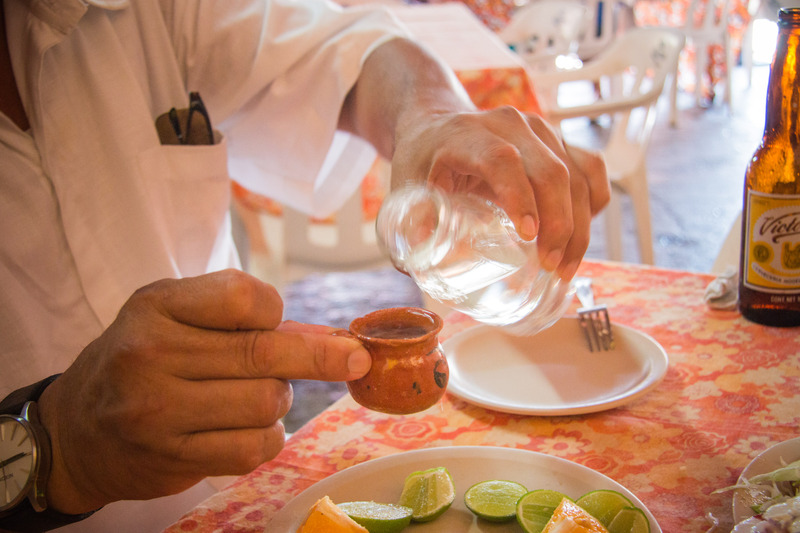 He serves the soup with mezcal from his favorite local distillery, La Katrina, which he pairs not just with orange but also ground cinnamon and a local sea salt that’s been seasoned with dried maguey worms – the same notorious bugs that found their way into the rotgut mezcal of the old days. He chuckles. He downs another shot of the intensely smoky liquor. He takes a wedge of orange and drags it through the salt and cinnamon and bites into it. 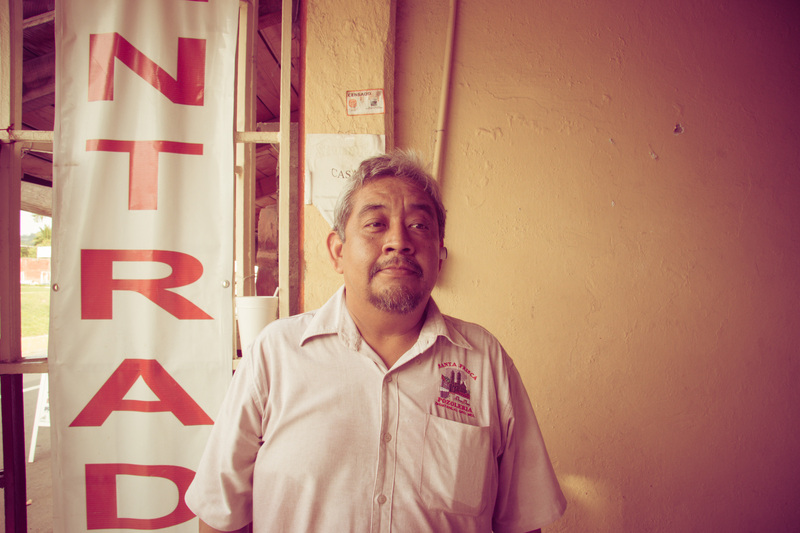 El Profe Pozoleria: Avenida Hildago, Coacoyul (just outside of town). Thursdays only. Santa Prisca Pozoleria: Avenida Victor Hugo, El Limon, Zihuatanejo. Thursdays only. Restaurante Any: Calle Ejido 18, downtown Zihuatanejo. Daily. A Mares: Capella resort, Avenida Playa Linda, Ixtapa. Daily. La Villa: Viceroy resort, Playa La Ropa, Zihuatanejo. Daily. Pozole Alley: Just off downtown’s main drag, Avenida Benito Juarez, between Nickolas Bravo and Juan Alvarez streets, is a small pedestrian-only walkway known by locals as Pozole Alley, where several restaurants serve pozole every day except Mondays, starting around 2 p.m. Especially busy on Thursdays. The best of these is Ricomar, on the back end of the alley. This article originally appeared in the Orange County Register¡, Los Angeles Register and Riverside Press Enterprise. To view more of my work for the Register, check out the archives.